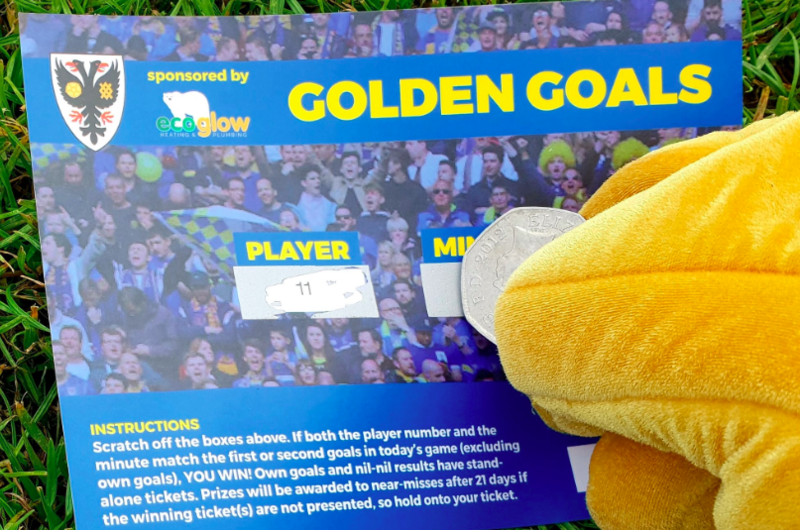 The Golden Goals is an incidental lottery, which takes place at most AFC Wimbledon home matches. It is run for the benefit of the Dons Trust – the not-for-profit society through which AFC Wimbledon supporters own our football club. The winning tickets will be listed here after each home match. The lottery takes the form of a scratchcard that anyone attending home matches can buy for £1. On the ticket are two areas for you to scratch off – a player number and a minute number. If both the player number and the minute match the first or second goals in the game (excluding own goals), then you win a prize. Own goals and nil-nil results have standalone tickets. Only one prize will be awarded if there is a nil-nil result or single goal in the match. Prizes will be awarded to near-misses (or random draw for nil-nil) after 21 days if the winning ticket(s) are not presented, so hold onto your ticket. The match number in the bottom right hand corner of the ticket will help you remember which match your ticket is from. To date, Golden Goals has raised over £200,000 for the Dons Trust, and is an enduring and popular part of our fundraising effort. At a time when the Trust is working hard to return AFC Wimbledon to its rightful home in Merton, every ticket sold is making a difference. The Dons Trust is grateful to EcoGlow Heating & Plumbing for their sponsorship of Golden Goals during the 2018/19 season. The winning goals will be announced over the public address during and at the end of the match, as well as being advertised here. If you have a winning ticket, please go to the PA box after the match. 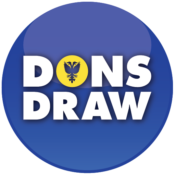 Alternatively, telephone 020 8547 3528 in office hours or email fundraising@thedonstrust.org no later than 21 days after the match. The player number corresponds to the order in which players are announced for each side, not shirt number. Minutes 45 and 90 include stoppage time in the first and second halves. Cup games that are goalless after normal time will be treated as nil-nil results. The organisers will determine the scorer and minute, and their determination on all matters will be final. If prizes remain unclaimed after 21 days, we will invite Golden Goal ticket holders to come forward within a given deadline. People with tickets within a given number of minutes either side of the winning ticket (regardless of which player number they have) will be invited to send us their ticket, along with their contact details. Say a goal is scored in minute 67, all the people who send in minute 67 would be put into a hat and one picked at random as the prize winner. If no one sends in minute 67, then we would turn to people who have sent in minutes 66 and 68; then 65 and 69; and so on. This procedure is modified for a winning ticket in minutes 1, 2, 89 and 90. Say a goal is scored in minute 89, all the people who send in minute 89 would be put into a hat and one picked at random. If no one sends in minute 89, then we would turn to people who have sent in minutes 88 and 90, then, 87, then 86, and so on. For a nil-nil match, we will do a random draw from 1 – 90 (to determine the notional minute of a goal) and invite ticket holders to come forward, as above. Unclaimed prizes will be donated to the AFC Wimbledon Foundation. The organisers reserve the right to change the procedures for allocating unclaimed prizes. Unclaimed prizes from previous matches will be listed here. As the deadline for claiming has now passed, we are now considering tickets with any player and minutes 20-24. The deadline for claiming: 4th May. As the deadline for claiming has now passed, both prizes (£125) will be donated to the AFC Wimbledon Foundation. As the deadline for claiming has now passed, both prizes (£100) will be donated to the AFC Wimbledon Foundation. 2nd prize (£25): There is no second prize for this match. £25 will be donated to the AFC Wimbledon Foundation. As the deadline for claiming has now passed, the prize of £25 will be donated to the AFC Wimbledon Foundation. As the deadline for claiming has now passed, the prize of £100 will be donated to the AFC Wimbledon Foundation.